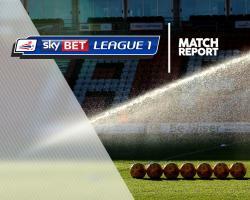 Swindon 0-1 Bolton- Match Report - Swindon Town MAD! Goalkeeper Lawrence Vigouroux's heroics were not enough as a late own goal condemned Swindon to a 1-0 home defeat to Bolton at the County Ground. The match was decided in the 86th minute when Josh Vela's shot was deflected by Brandon Ormonde-Ottewill into the bottom left-hand corner. It got worse for Swindon in stoppage time when Raphael Rossi Branco was given a straight red for an elbow on Lawrie Wilson. The victory for Bolton is their first win in the league in eight matches. The first chance for the away side came in the ninth minute after the ball deflected off Yaser Kasim, leaving James Henry to go through one-on-one but he dragged his shot wide. Swindon had their first real attempt in the 13th minute as Ormonde-Ottewill's cross found Nathan Delfouneso at the back post but he could not keep his header down. Henry had another chance in the 32nd minute but he was denied by Vigouroux who initially slipped as he scampered across his box but got back up to deny the winger.